Fellow Svengoolie SvenPals will be excited for his upcoming big broadcast of a classic Universal Studios monster farce with the studio’s comedic duo. A brief moment from “Abbott and Costello Meet Frankenstein” (1948), with Lou Costello, Glenn Strange and Bela Lugosi. Original Universal Studios exhibitors’ supplement for “Abbott and Costello Meet Frankenstein” (1948). The legendary Berwyn/Chicago-based horror film host will present his big broadcast showcase of “Abbott and Costello Meet Frankenstein” (1948), this Sat., Oct. 20 at 8 p.m. Eastern/7 p.m. Central on Me-TV. 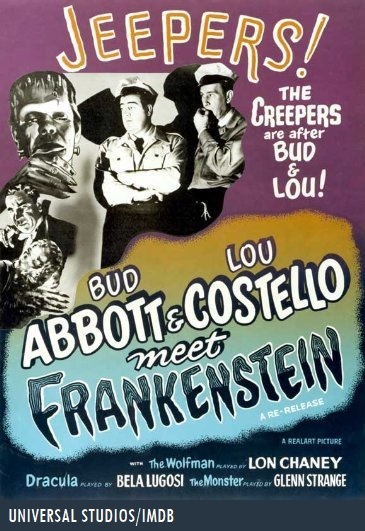 The landmark Abbott and Costello-Universal monster cross-over feature was directed by veteran studio director Charles T. Barton (this was Barton’s fifth screen production with the legendary comedy duo). That same year, Barton worked on Abbott and Costello’s non-Universal feature comedy entry for competing studio Eagle-Lion Films, “The Noose Hangs High” (1948, w/ Leon Errol, Cathy Downs, Fritz Feld, Joseph Calleia and Mike Mazurki). 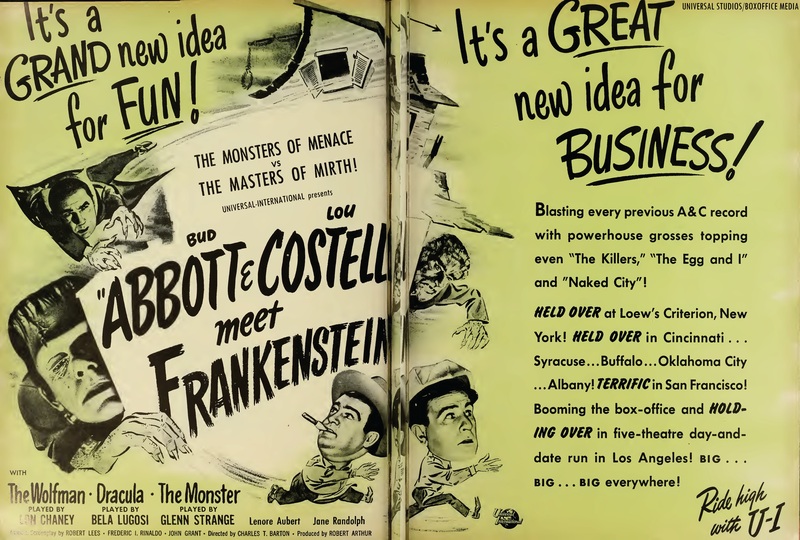 This will mark Sven’s seventh big broadcast of “Abbott and Costello Meet Frankenstein” (1948) from coast-to-coast on Me-TV. He had previously shown the celebrated Universal monster comedy classic from coast-to-coast back in Oct. 2011*, Nov. 2013, Oct. 2014, April 2015, Oct. 2016 and Nov. 2017.
Who was in “Abbott and Costello Meet Frankenstein” (1948)? The players who appeared in Barton’s Universal monster/Abbott & Costello comedy were Bud Abbott (as Chick Young), Lou Costello (as Wilbur Grey), Glenn Strange (as Frankenstein’s monster, this marked Strange’s third Universal feature film appearance as Frankenstein’s monster; he previously played the role in 1944’s “House of Frankenstein” and 1945’s “House of Dracula”), Bela Lugosi (as Count Dracula; this marked Bela’s second and final screen appearance as Count Dracula in a Universal production, ), Lon Chaney, Jr. (as Lawrence “Larry” Talbot/the “Wolf Man;” this marked the junior Chaney’s fifth Universal feature appearance as Lawrence “Wolf Man” Talbot; he previously played the role in 1941’s “The Wolf Man,” 1943’s “Frankenstein Meets the Wolf Man,” 1944’s “House of Frankenstein” and 1945’s “House of Dracula”), Jane Randolph (as Joan Raymond), Lenore Aubert (as Dr. Sandra Moray), Charles Bradstreet (as Dr. Stevens), Frank Ferguson (as Mr. McDougal), Harry Brown (in an uncredited role as a photographer), Bobby Barber (in an uncredited role as a waiter) and an uncredited voice-over cameo by a young Vincent Price (as a uncredited Universal “monster” who made a surprise appearance in the film). 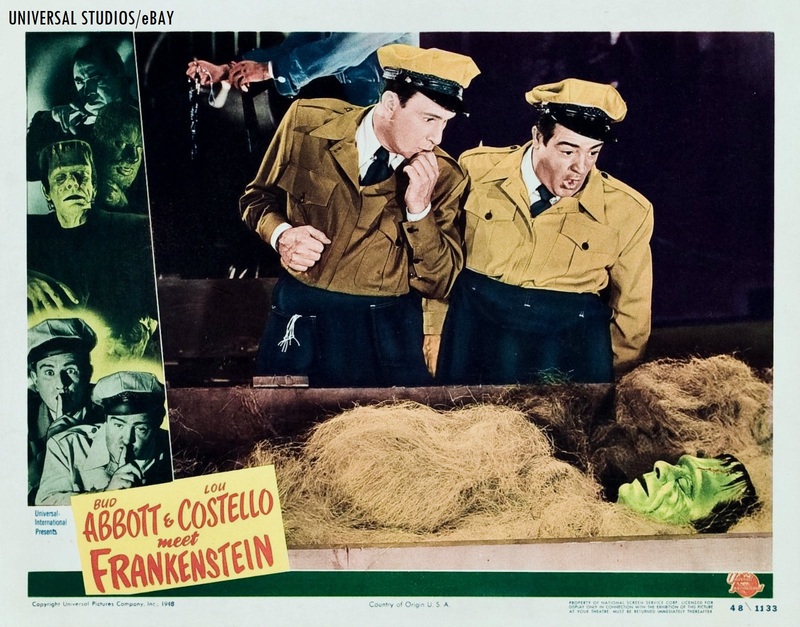 Realart re-issue poster for Universal‘s “Abbott and Costello Meet Frankenstein” (orig. released in 1948). 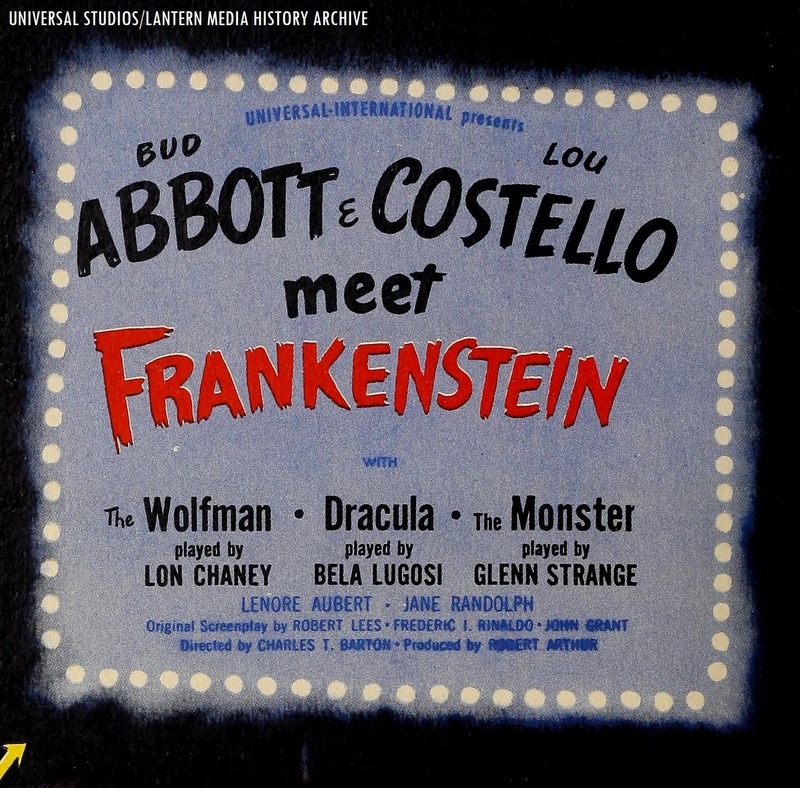 According to Jeff Stafford’s article on “Abbott and Costello Meet Frankenstein” (1948) for Turner Classic Movies, Bela Lugosi was one of the few cast members that did not enjoy the off-set antics of Bud, Lou and the rest of the cast/crew members; as Lugosi took his role of “Count Dracula” in a serious manner. Abbott and Costello did this as a way to eliminate boredom on the Universal soundstage. In addition to poker games and exploding “prop” cigars as part of Bud and Lou’s antics to keep the cast amused between takes, pie fights from Universal’s star comedic duo also took place on the set. According to IMDB’s trivia section for “Abbott and Costello Meet Frankenstein” (1948), actor Bobby Barber worked in another uncredited position as the off-stage “court jester” in order to keep up comedic timing throughout the film. Bela Lugosi admired Barber’s jokes, but was not pleased with Barber whenever additional jokes and impersonations were aimed at Lugosi’s celebrated “Count Dracula” characterization. One year after the release of “Abbott and Costello Meet Frankenstein,” Lenore Aubert appeared with Bud Abbott and Lou Costello in another Universal monster comedy with one of the silver screen legends of horror; Boris Karloff in “Abbott and Costello Meet the Killer, Boris Karloff” (1949, which was also directed by Charles T. Barton). 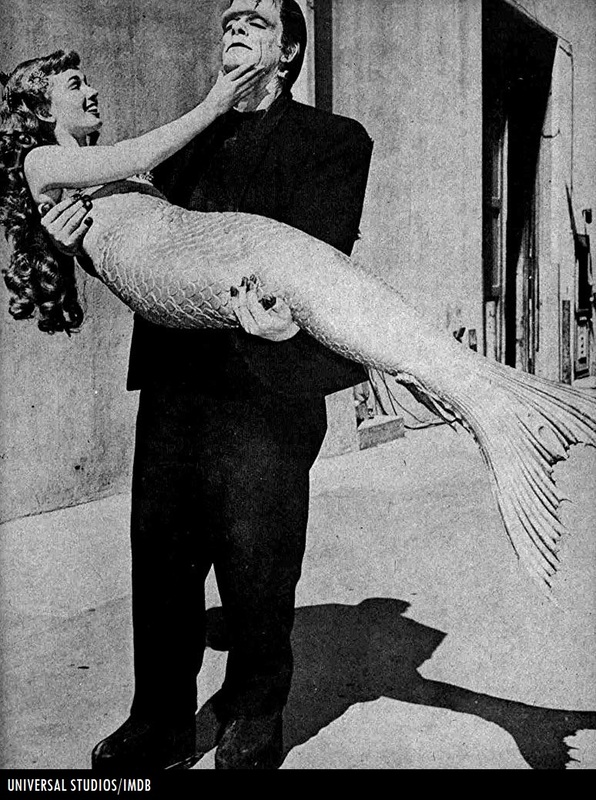 1948 Universal Studios publicity shot of Glenn Strange (as Frankenstein’s “monster” from “Abbott and Costello Meet Frankenstein“) carrying Ann Blythe as the “mermaid” from “Mr. Peabody and the Mermaid“). While wearing his “Frankenstein” monster make-up and outfit, Glenn Strange decided to join fellow Universal contract player Ann Blyth for lunch. Blyth appeared as the “mermaid” in Universal’s production of “Mr. Peabody and the Mermaid” (1948, directed by Irving Pichel, with William Powell and Irene Hervey). Universal studio tour guests were shocked to see Strange and Blyth in their characterizations (notably Strange’s “Frankenstein” monster outfit), according to additional details from IMDB’s trivia section. Both Strange and Blyth also appeared in a Universal publicity photo session, where Strange’s “Frankenstein” monster character was carrying Blyth’s “mermaid” character across the Universal backlot. Strange, along with Lon Chaney Jr. were also invited to the “Mr. Peabody and the Mermaid” production wrap party. It was reported that both Strange and the junior Chaney appeared in their trademark “Frankenstein” monster and “Wolf Man” characterizations for the “Mr. Peabody” wrap party. Be sure to watch or record Svengoolie and his big broadcast showcase of “Abbott and Costello Meet Frankenstein” (1948), this Sat. on Me-TV! “Who’s on first?” Svengoolie (portrayed by Rich Koz), Kerwyn and all fellow coast-to-coast SvenPals are ready for his Sat. big broadcast of “Abbott and Costello Meet Frankenstein” (1948) on the airlanes of Me-TV! With Bud, Lou, Glenn, Bela, the junior Lon, Lenore, Vincent, Jane, Charles, Frank, Harry and Bobby, you will not want to miss out on Svengoolie’s upcoming big broadcast of the classic Universal monster farce, “Abbott and Costello Meet Frankenstein” (1948), this Sat. on the airlanes of Me-TV! A perfect pre-Halloween treat for all fellow SvenPals, fellow aficionados of Universal’s classic monster features and classic Abbott & Costello comedies; with Sven’s extended fun facts, Doug Graves’ parody musical intermission and Kerwyn’s “mail call” segment! Don’t miss out on one of Sven’s most requested classics! And to those that have never experienced Sven’s Sat. Me-TV showcase before, “Abbott and Costello Meet Frankenstein” (1948) is one of many perfect introductory films to the world of Sven, classic horror/monster features, classic comedy! Highly recommended! Live-tweet (via Twitter) during Sven’s big Me-TV broadcast of “Abbott & Costello Meet Frankenstein” (1948) with all fellow #Svengoolie SvenPals from coast-to-coast! Berwyn’s Finest! 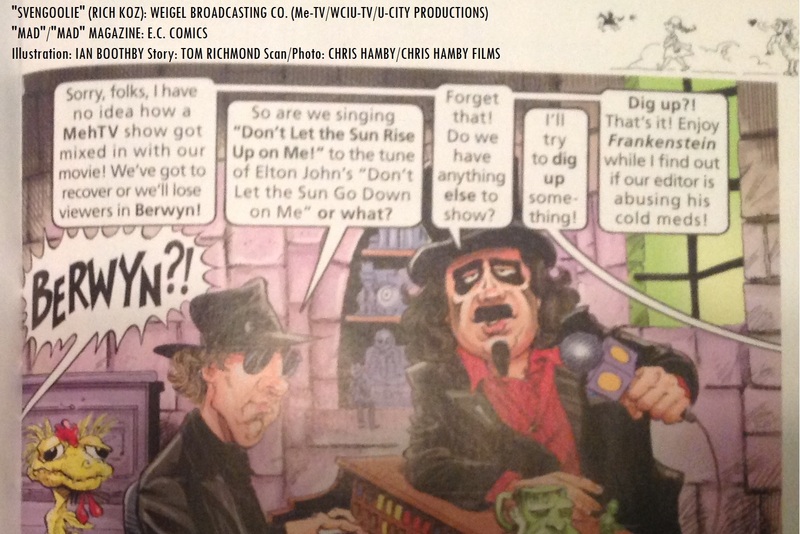 Kerwyn, Svengoolie (portrayed by Rich Koz) and Doug Graves (portrayed by Doug Scharf) in Tom Richmond and Ian Boothby‘s Oct. 2018 “Mad” Magazine Sven satire segment! The latest issue of “Mad” Magazine #4, with a mention of Svengoolie on the front cover! “What, Me Worry?” “Sven, golly, it’s ‘Svengoolie’!” During a recent outing for errands at my local Giant Food supermarket location in Frederick, I purchased a copy of the Dec. edition of “Mad” Magazine (No. 4, “Special Haunted Humor Issue”)! 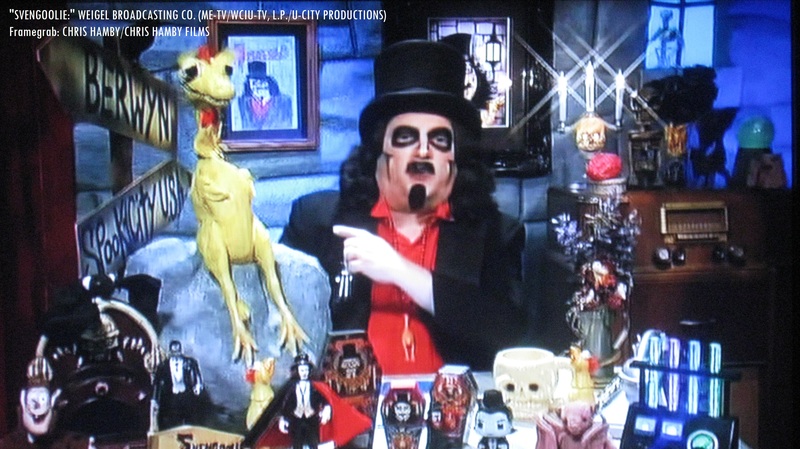 The issue featured a cameo Svengoolie satire segment by illustrator Ian Boothby and writer Tom Richmond (featuring sketches of Sven, Doug Graves and Kerwyn and cross-over segments of classic notable monster film characters and characters from notable classic television shows on Me-TV (or “Meh-TV” in the “Mad” Sven segment)! 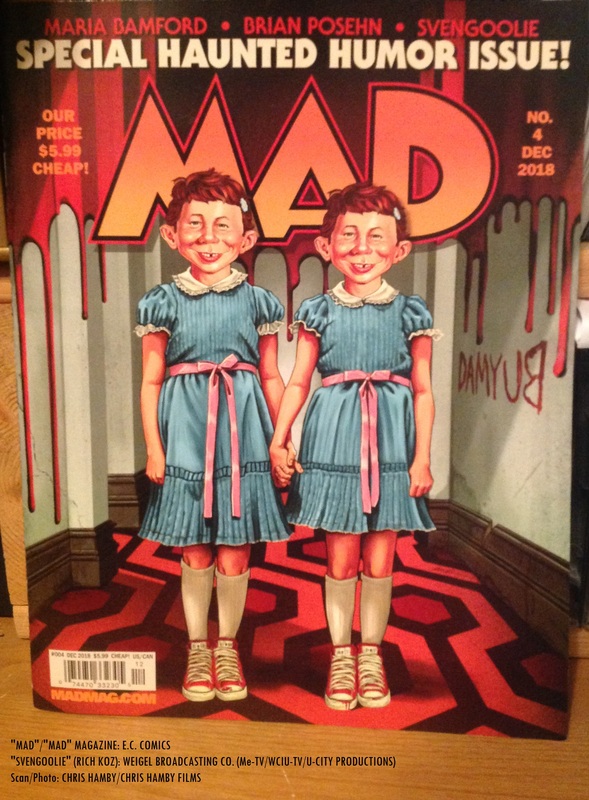 The latest issue of “Mad” magazine is now available at your favorite supermarket, bookstore and/or comic book retailer! Congratulations to Sven, Doug and Kerwyn on your recent “Mad” magazine appearance on behalf of all of us fellow SvenPals! -C.H. Chicago’s very own and Berwyn’s very own! Sven’s alter-ego, Rich Koz will be making an upcoming on-air guest host appearance on Chicago’s WGN Radio (720 AM) on Mon., Oct 29 with the executive producer of Sven’s show, Jim Roche from 11 p.m.-1 a.m. Central/Midnight-2 a.m. Eastern (WGN’s 50,000 watt signal can be received throughout most of the country after dusk)! And on Halloween (Wed., Oct. 31), Sven will be making a daytime guest appearance with WGN’s very own Bill Leff and Wendy Snyder on the “Bill and Wendy Show” at 11:30 a.m. CT/12:30 p.m. ET! “Chicago’s Very Own,” WGN Radio can also be heard online on the official WGN Radio site! Fellow Chicago/Berwyn/Volo/Des Plains SvenPals, Valparaiso/Hammond SvenPals and fellow SvenPals who are traveling to Chicago/Berwyn/Volo/Des Plains and Valparaiso/Hammond: Sven willbe making an upcoming appearance in Hammond, Indiana for the “Haunting in Hammond” celebration this Fri., Oct. 19 from 4-6 p.m. (local time, at the EAT Restaurant, 5201 Hohman Ave, Hammond, Indiana 46320)! Sven will also be having a photo and autograph session during the festival! Zip into the famous Volo Auto Museum on Sat., Oct. 27 for Svengoolie’s Volo appearance (27582 Volo Village Rd. Volo, IL 60073) for Sven’s autograph and a professional photo session by the staff photographer of the Volo Auto Museum (and check out the classic cars on display at the Volo Auto Museum) from Noon to 2 p.m. (local time)! Note: No personal cameras are allowed during the Sven photo session at the Volo Auto Museum (according to Sven’s official site). (3000 S. River Road Des Plaines, IL 60018) for the Cube Nightclub Halloween Costume Party from 11 p.m.-1 a.m. (local time), with music provided by legendary Chicago disc jockey Julian “Jumpin’ ” Perez! Sven will also be having a photo and autograph session during the Cube/Rivers costume party (Sven will also be emceeing the contest)! Additional info is available on the official Rivers Casino site! According to Sven’s official list of appearances, he will be making a Halloween night appearance with the legendary Chicago Bulls basketball team during the Bulls’ Halloween night game (United Center in Chicago, Illinois)! To all fellow SvenPals of Chicago/Berwyn/Volo/Des Plains, Valparaiso/Hammond and fellow SvenPals who are traveling to Berwyn/Chicago/Volo/Des Plains and/or Valparaiso/Hammond, have fun seeing Sven in person for his upcoming in-person appearances in Hammond, Volo or Des Plains, , Sven and Freddy for the “Nightmare on Chicago Street” Elgin festival and/or Sven’s Chicago Bulls appearance! -C.H. Many fellow super SvenPals jumped for joy during Sven and Kerwyn’s “mail call” during Sven’s big Oct. 13 Me-TV broadcast premiere of “Cry of the Werewolf” (1944)! Family members of fellow super SvenPal Sgt. Waggoner were featured on Sven and Kerwyn’s “mail call” segment, along with an awesome custom “Sven”/”Godzilla-style” drawing by the youngest member of Sgt. Waggoner’s family! At the end of Sven and Kerwyn’s “mail call,”fellow super SvenPal Professor Frenzy was featured in a cameo photo appearance with his official Sven “official chicken thrower” T-shirt at the recent “DragonCon” convention in Atlanta! Congratulations to Sgt. Waggoner’s family and Prof. Frenzy for appearing in Svengoolie and Kerwyn’s “mail call” segment! All of us fellow super SvenPals are proud of you! -C.H. Jam along to more Halloween goodies of past and present with fellow super SvenPal Jamie Lee and her live Sat. morning WNUR/Northwestern University radio show, “Jammin’ with Jamie!” Jamie will be continuing her Halloween jam session and has encouraged all fellow SvenPals and jammers to send in requests for Halloween tunes from film, television and theatre! If you have a Halloween-related song in mind, be sure to send in your request(s) to Jamie’s Twitter feed or Jamie’s official site before this Sat. and jam along to more Halloween favorites on “Jammin’ with Jamie;” Sat. mornings at 6 a.m. Central/7 a.m. Eastern on the WNUR airlanes (89.3 FM in the Evanston/Chicago/Berwyn area; online at WNUR.org and/or the TuneIn app/platform from coast-to-coast and around the world)! Highly recommended to all fellow SvenPals and jammers from coast-to-coast! Keep on’ jammin’, Jamie and all fellow Jammers/super SvenPals! A fantastic and fun Sat. morning radio show! We’re all proud of you! And again, donate generously/spread the word to help one of Jamie’s PM&L friends with additional medical treatments by helping to offset the cost (via GoFundMe). Any amount helps! –C.H. Enter to win a copy Universal’s “Abbott and Costello Meet the Monsters” DVD anthology set, via Classic Film Hub! Questions/comments about “Svengoolie” and/or his big broadcast showcase of “Abbott and Costello Meet Frankenstein” (1948)? Drop a line at the comments section! ← Extra! A family connection to actor Barton MacLane (in honor of “Svengoolie” and his big Me-TV broadcast premiere of 1944’s “Cry of the Werewolf” on Me-TV)!